The egg is liked by both vegetarians and nonvegetarians equally. Most of the veggies who do not eat meat eat egg. Eggs are wonderful ingredients which can be turned into a variety of dishes quickly and easily. Egg curry can be made with lots of variations and each one will be different due to regional tastes. Some likes egg roast, some need egg gravy, some need egg curry and so on.. 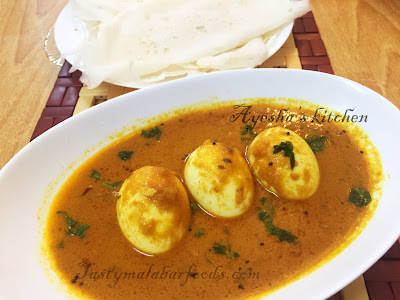 Here am presenting a delicious and quick egg curry which is great for breakfast. This is an easiest and everyone's favorite curry with egg. 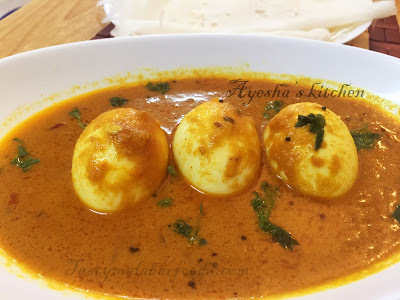 The hard boiled egg is cooked in a spicy onion tomato gravy which blends with the garam masala and other spice powders. It tastes very similar to Indian chicken curry. Do enjoy this spicy tasty curry with your favorite meals. Heat oil in a pan and saute cinnamon and cardamom for few seconds. Now splutter mustard seeds. When done add garlic fennel seed paste. Saute till the raw smell disappears. Add in the finely sliced onions and saute till golden in a medium flame. Now add turmeric powder, chili powder, coriander powder, and salt. Mix well. Now pour half a cup boiled water and mix well. Check for salt and add chopped coriander leaves. Finally, add the hard boiled egg ( make some small slits with a knife on eggs). Mix well and cook with lid closed till the oil floats on top. Serve with dosa, chappathi, rice, appam etc..